Starting this past fall, I finally noticed that the current Department of Energy was not the old Department of Energy. In October 2017, DOE cooperated with the Nuclear Energy Institute and held the first Millennial Nuclear Caucus, in Washington DC. At that event, Secretary of Energy Rick Perry met with a group of young nuclear professionals. 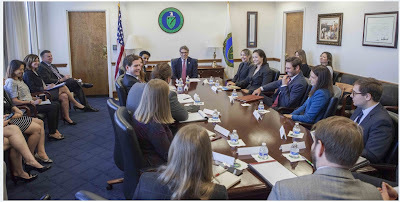 In a post on the DOE website, Secretary Perry said: "I had the pleasure of meeting with a number of young visionaries in the nuclear field this morning." As a matter of fact, the hashtag for the Millennial Nuclear Caucus meetings is #NuclearVisionaries. Here's a brief video of part of the meeting. When I saw the announcement of the first caucus, I felt terrific. The Department of Energy promoting young people and nuclear! Well, the only word was--- awesome! Now, first of all, I would be happy even if this new look by DOE were only hype. I am happy that the the government is holding and co-sponsoring events like the Millennial Nuclear Caucus. Previous administrations tended to act as if nuclear power were some sort of embarrassment. The current DOE Facebook page and the nuclear-positive events show a change in attitude. However, if you go to the video of the Texas meeting on the Facebook page, you will see Rod Adams ask a question that he admits puts Suzie Jaworowski "on the spot." (Move the slider to about 1:02) To paraphrase Adams's question: This is all very good, but the DOE budget proposal has less money for nuclear for next year than it had for this year. Is DOE really going to be able to support nuclear? Side note: Optimism, pessimism, realism and everything in between before the official start of the Advanced Reactor Summit V is Rod Adams post which includes his comments on the Millennial Caucus meeting. What was Jaworowski's answer? Since the budget isn't totally set, the answer couldn't be totally set either. Jaworowski answered that DOE is focusing on its priorities. High priorities include keeping the existing fleet going, and keeping the pipeline of future projects underway. There are also plans for public-private partnerships, with government and private money leading to innovations. You might say Jaworowski gave a standard-issue answer, and maybe it was. But I notice the nuclear group at DOE running events, making videos, posting to FB, and I am encouraged. The federal government has been running immense deficits for years, and the Republicans are the party of "small government and decreased government spending." Therefore, budget cuts were inevitable, from both a practical (deficits) and policy (Republican) point of view. Considering that budget cuts will be coming, the new pro-nuclear initiatives of the current administration are very welcome. In other words, if the major role of the government is to spend money, then things are looking bad. If the major role of the government is to set policy, then things are looking better. I think this administration's policies will be pro-nuclear. I believe these policies will have an impact. I am well aware that support of energy initiatives usually requires both policy and money. I know money/policy is not a simple either-or. However, setting policy is the first step. If you look at Rod Adams post (linked above) you can see a somewhat more pessimistic evaluation of the future of nuclear. I'm not so sure of myself as to say he is wrong. And he isn't completely pessimistic, either. Maybe I am just an optimist. Still, I am optimistic about the DOE initiatives. 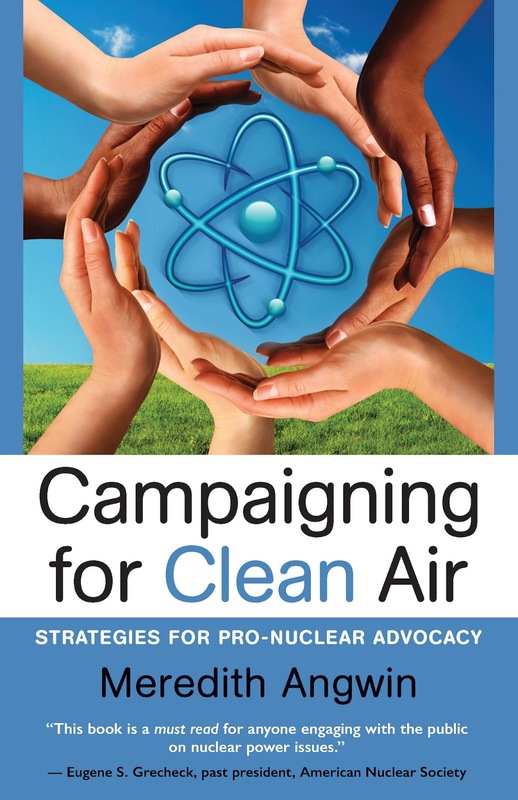 Thank you for your orders of Campaigning for Clean Air! I was right, and George was wrong. When I told my husband George that I was going to set up a President's Day reduced-price offer for the paperback version of my book, he said that such an offer was useless. He claimed that my target audience is not price-sensitive. I told him that marketers do this all the time, because everyone likes a deal. Plus---people like a signed book. I was right. He was wrong. But the main thing was: I had fun! Tell your husband that students are price-sensitive! Hope you win your bet! I have a copy of your book, but I want a signed copy that I can keep for myself. I won't lend it to friends (as I do with my current copy). From over here in Vernon, near Vermont Yankee, thank you for everything you do. Tell George he is wrong. The sale is over, but the book is widely available. 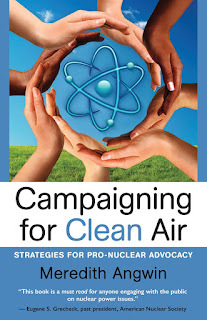 Whether you are a member of the American Nuclear Society or not, you can buy both the paperback and the ebook through the American Nuclear Society . Members get a discount. You can also buy the book from Amazon or Nook or Kobo. Most people seem to buy it from Amazon. If you go to your local library, you can ask them to order a copy of the book. The paperback book is available from Ingram Spark, as well as being available from the various places listed above. As I understand it, libraries prefer Ingram Spark. The audiobook is available from Overdrive. Overdrive is set up for bulk audio orders, and to fufill orders from libraries. However you obtain the book, I hope you enjoy it! 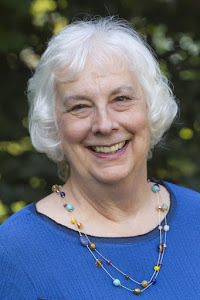 I told my husband George that I was going to set up a President's Day limited-time reduced-price offer for buying the paperback version of my book. You can buy my book from Amazon on $17.95 plus shipping....or you can buy it directly from me at $16, shipping included. Plus...I will sign it! This is the lowest price I have ever offered to anyone. The catch is that you have to order it today or tomorrow. This is a limited time offer. More about that below. My husband said that such an offer is useless: my target audience is not price-sensitive. I told him that marketers do this all the time, because everyone likes a deal. Plus---people like a signed book. Free shipping and a lower price and a signature! Prove me right. Prove him wrong. Order the book today or tomorrow. This deal is only on the paperback book. To order the paperback book, go to your paypal account, and choose to "send money" to mjangwin at earthlink.net. Send $16. Be sure to include your mailing address in the proper area of the paypal form. This offer closes at midnight tomorrow night (February 20). If you prefer an ebook edition, you have to order it at full price from Amazon or Nook or Kobo. However, if you are a member of ANS, you can get a reduced price ebook by ordering it through ANS. If you want the paperback, order it from me at a discount. Today or tomorrow! 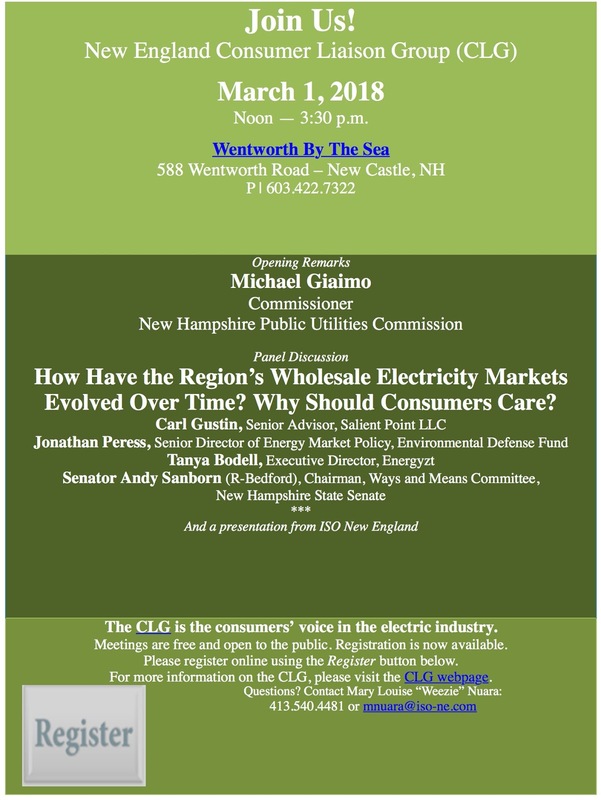 On March 1, the Consumer Liaison Group (CLG) associated with ISO-NE will hold its quarterly meeting near Portsmouth, New Hampshire. Meetings are free and open to the public, and include a free lunch. (Rather a pleasant lunch, usually, not just some dry sandwiches.) I am on the Coordinating Committee for the CLG. The topic for this meeting is "How Have the Region's Wholesale Markets Evolved Over Time? Why Should Consumers Care?" In other words, this meeting addresses the heart of consumer concerns with the grid. I encourage you to attend. You can also register for phone access, and the slides are usually posted. About two weeks ago, I wrote a blog post The Northeast Grid and the Oil. This described our early-January polar weather, and how Northeastern power plants could not get enough natural gas in the below-zero weather. Homes had priority for natural gas delivery, and plants that could use oil switched from natural gas to oil. As a matter of fact, the oil stocks were also getting depleted. I want to update the cold-snap story with some other posts. The general public doesn't read my blog, so I did some outreach. I wrote an op-ed about the grid for my local paper, the Valley News. The op-ed was printed on the front page of the Sunday Perspective section on January 28, and has been shared around 200 times on Facebook. Oil Kept the Power Grid Running in Recent Cold Snap. Why were people so interested in the article? Because a secure electric supply is an important part of personal safety during extremely cold weather. Most home furnaces require electricity to spread the warmth into the household. People who have chosen heat pumps are also dependent on reliable electricity. Nuclear plants and pipelines and controversy, oh my! There were more articles on the situation, of course, not just mine. Actually, I think there were too few articles. Nearly running out of oil when you can't get gas---this can be a major deal during severe winter weather! I will point out some interesting articles, and I hope that people who read this will send links to a few more. Rod Adams post described the "sobering statements" made by the grid operator about oil supply, and the weird statements made by nuclear opponents. (Pilgrim should have shut down before the storm? Really?) He shares some graphics from ISO-NE on the weak performance of solar panels during the days of the crisis. He also discusses Pilgrim going off-line, and whether that could have been prevented. As usual, his post has an active and informed stream of comments. Performance of the New England power grid during extreme cold Dec 25-Jan 8, at Atomic Insights blog. Meanwhile, over at Forbes, several columnists were commenting on the situation. Over WBUR radio, Bruce Gellerman has a fascinating seven minute segment on how the power plants actually operated during the cold snap, including an interview with a manager of a peaker plant that runs about 800 hours a year. Do We Need More Natural Gas Pipelines? There's a lot of controversy built into all these articles. The role of nuclear. The need (or not-need) for more natural gas pipelines. Will new emissions regulations make handling the next cold snap much harder? 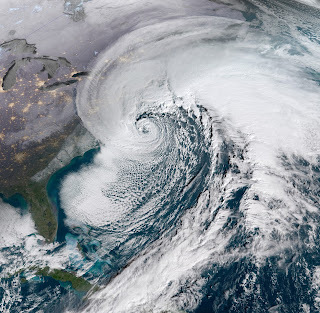 Did renewables make a great contribution during the cold snap? Or not? A steady electric supply is hugely important to winter safety. In my opinion, it should not be such a subject of controversy. My hope is that reason will prevail, and we will have the nuclear plants, pipelines and energy security that we need.